After hearing of the plight of fourteen year old Charlotte Robinson who contracted Meningococcal Septicaemia in May this year two Chiswick brothers have set themselves the task of helping to raise the thousands needed to provide Charlotte with prosthetic limbs. 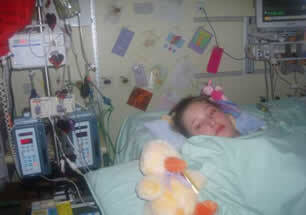 Charlotte was on a life support machine for 2 weeks and suffered total liver, gut, lung and kidney failure. Following a second attack of Toxic Shock, she had to have both her legs amputated from the knee down to prevent further infection. Steven Smith, a backstage artist / scriptwriter and his brother James, an actor and scriptwriter thought they would put their spare time to good use and came up with the idea to advertise themselves as handy helpers and donate all the money they earn to The Charlotte Robinson Trust. "We have raised a brilliant £1019.19 so far for the fund but we still want to keep going, we don't want to leave it here." says Steve who is keen to drum up further business.